Mastitis is an inflammation of one or more quarters of the udder usually caused by bacterial infection. Several types of bacteria cause distinctly different mastitis infections. Most mastitis persists as subclinical infections and is not detected by the milker, only occasionally are there clinical signs with clots in the milk and inflamed quarters. Mastitis reduces milk yields, increases the cost of production and makes milk less valuable for liquid consumption and manufacture. The pattern of infection in dairy cows. Mastitis is an inflammation of the udder and is common in dairy herds causing important economic losses. It cannot be eradicated but can be reduced to low levels by good management of dairy cows. Of the several causes of mastitis only microbial infection is important. Although bacteria, fungi, yeasts and possibly virus can cause udder infection the main agents are bacteria. The most common pathogens are Staphylococcus aureus, Streptococcus agalactiae, Str. dysgalactiae, Str. uberis and Escherichia coli though other pathogens can cause occasional herd outbreaks. Mastitis occurs when the teats of cows are exposed to pathogens which penetrate the teat duct and establish an infection in one or more quarters within the udder. The course of an infection varies, most commonly it persists for weeks or months in a mild form which is not detected by the stockman (ie. subclinical mastitis). With some pathogens, typically E coli, the infection is frequently more acute and there is a general endotoxaemia with raised body temperature, loss of appetite and the cow may die unless supportive therapy is given. When clinical mastitis occurs the effective therapy is a course of antibiotic infusions through the teat duct. These nearly always remedy the clinical disease and often eliminate the bacterial infection. Infections may spontaneously recover but most persist to be eliminated eventually by antibiotic therapy or when the cow is culled. The susceptibility of cows varies considerably and new infections are most common in older cows in early lactation, at the start of the dry period and when the management is poor. Mastitis causes direct economic losses to farmers in several ways. Milk yields are reduced, milk that is abnormal or contaminated with antibiotics is unsaleable, there are veterinary and antibiotic costs, a higher culling rate and occasional fatalities. The milk processing industry also incurs losses because of problems that result from antibiotic in milk, and the reduced chemical and bacterial quality of mastitic milk. Mastitis microorganisms, usually bacteria, originate in various sites on the cow. They multiply in various ways and are spread from cow to cow. Most common types of mastitis bacteria originate in the udders of infected cows and in sores on tests. These pathogens multiply in teat sores and are spread during milking. Other serious forms of mastitis are caused by bacteria which come from other sites on the cow (eg. in dung). These bacteria multiply in bedding materials. Mastitis inflammation can be detected by simple tests on cows milk (eg. CMT test) but the causative bacteria can be detected only by laboratory tests. The several microbial diseases of the udder that are collectively known as mastitis are distinctly different. The pathogens can arise from different primary sites, they multiply in different environments and therefore the timing of the exposure of the cow to the bacteria will vary. Subsequently the acuteness and persistency of the infections differ and also the probability of cure when therapy is given. The commonest forms of mastitis in most countries are caused by S. aureus and Str. agalactiae. The primary sites of these is the milk of infected quarters and therefore they are spread mainly at milking, either during udder preparation or on hands and milking machines. These pathogens can colonise and multiply in teat sores and in teat ducts and this greatly increases the degree of exposure of the teats to bacteria. They usually cause chronic infections which persist in the subclinical form and occasionally become clinical when abnormal milk can be detected. Systemic infection with loss of appetite and raised body temperature is infrequent. When suitable antibiotic preparations are infused into the udder the clinical mastitis nearly always subsides and most Str. agalactiae infections are cured but with staphylococcal infections the cure rate is poor and most persist. Infections caused by Str. uberis and E. coli are often called ‘environmental’. The main primary sites of the pathogens are bovine, but not from within the udder. These do not normally colonise teat skin and the multiplication occurs in organic bedding materials (eg. straws and sawdust). 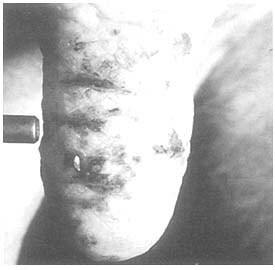 These types of infection are most common in housed cattle in early lactation and whilst they can cause persisting subclinical mastitis the more typical from is clinical mastitis soon after the onset of the infection, and with coliform mastitis the endotoxaemia causes raised body temperature and marked reductions in milk production. Str. uberis infections usually respond to therapy but with E. coli infections it is important to give supportive treatment to overcome the endotoxaemia and if this is successful spontaneous recovery usually follows. Str. dysgalactiae is similar to Str. agalactiae and S. aureus in that it can readily colonise and multiply in teat lesions but the main primary site is not the milk of infected quarters, but other bovine sites. The course of the infection is not dissimilar to Str. agalactiae and infections respond readily to antibiotic therapy. Many other microorganisms can cause mastitis. These less common forms are not usually important but pseudomonads and Mycoplasma bovis does cause serious problems in a few herds. Although the pathology of the various types of infection show distinct differences the causes of infection can be diagnosed with certainty only by bacteriological tests made on aseptically taken quarter milk samples. Bacterial exposure is greatly increased when bacteria multiply in teat sores and ducts or in grossly contaminated bedding. The former can be prevented by post milking teat disinfection, the latter by providing clean bedding. Penetration of the teat duct can occur either during milking or between milking. It is most common with damaged teats and with poorly designed milking equipment which gives ‘reverse flow’ of milk during milking. THE COW HAS SEVERAL NATURAL DEFENCES AGAINST INFECTION, THE MOST IMPORTANT ONE IS THE HEALTHY TEAT DUCT WHICH PREVENTS BACTERIAL PENETRATION. The defence mechanisms within the udder act mainly to reduce the severity of infections but can eliminate some types of infection. Many factors influence the frequency of mastitis infection and management is particularly important. New infection is most common at drying off, at calving, in older cows and in poorly managed cows. All dairy cows are continously exposed to pathogens that can cause mastitis but new infection is normally infrequent. This is because the exposure to pathogens is usually small. The number of pathogens in the milk of infected quarters will vary from less than 1000 to many millions per ml of milk but it is usually less than 10,000 per ml and further diluted by the milk from the majority of uninfected quarters. The number of pathogens on clean pasture will be extremely small. The exposure of cows teats to S. aureus, Str. agalactiae and Str. dysgalactiae will be greatly increased when teat sores and lesions on teat ducts are colonised by these mastitis pathogens or when cows lie on contaminated bedding or corrals. Occasionally the exposure will be increased from improperly cleaned milking equipment or through udder washing with contaminated water. This can be avoided by adopting simple methods of cleaning equipment (see page 29). The most effective way of reducing the exposure to S. aureus, Str. agalactiae and Str. dysgalactiae is by dipping or spraying the teats in disinfectant immediately after milking. A number of disinfectant products are available and good results are obtained with hypochlorite, iodophor and chlorhexidine. Teat disinfection greatly reduces residual contamination and more importantly encourages healing of teat sores and lesions and also prevents the growth of pathogens in teat ducts (ie. colonisation). Other practices such as udder washing with disinfectant, rinsing milking equipment after each cow is milked (eg. back flushing) will also reduce exposure but their effects are smaller than teat dipping because they do not influence the colonisation of teat sores and ducts. To maintain low levels of exposure it is most important to maintain healthy teat skin and avoid sores, chaps and any form of teat damage. To maintain good teat condition emolients or salves (eg. glycerol) can be added to most teat dips but not to hypochlorite. While soil and fresh bedding materials are usually relatively free from mastitis pathogens they can develop a very large pathogen population (>106/gm) within a few days given the optimum conditions of moisture and temperature. Inevitably bedding becomes moist and contaminated with faeces and given sufficient warmth the growth of E. coli and Str. uberis is rapid causing outbreaks of mastitis. This can be prevented by avoiding using muddy corrals and by keeping cows on clean pasture. When cattle are housed on straw or sawdust in yards or in cubicles (freestalls), it should be replenished frequently, preferably daily. Straw yards should be cleaned completely if outbreaks of clinical mastitis occur. For cows kept in cubicles sand can be used successfully as a non-organic bedding material in which coliforms and Str. uberis do not readily multiply. The healthy teat duct (streak canal) is extremely effective in preventing the passage of pathogens into the udder and it is the cows most natural barrier against mastitis infections. It not only acts as a physical barrier against penetration but the lining of the duct also contains secretions that inhibit bacterial growth. Pathogen penetration can occur during milking, in the intervals between milking and even when cows are not lactating. If pathogens penetrate during milking they may be flushed out otherwise infection usually occurs. It is most important to recognise that even when very small numbers of pathogens (eg. less than 20) penetrate the duct infection usually occurs. Apart from the increased rate of penetration that occurs with high rates of exposure there are other factors in cattle management that are important. These occur with faulty machine milking and also if milkers insert contaminated objects (eg. dirty treatment syringes) through the teat duct. 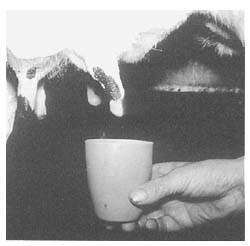 Under certain milking machine conditions there are considerable vacuum fluctuations in the teat cup liner below the teat. In the resulting turbulence the milk which is normally flowing away from the teats returns to the teat through the short milk tubes (ie. reverse flow or impacts). These impacts can have sufficient force that the pathogens carried in the milk penetrate into or through the teat duct causing infection. These infections can be reduced by using a milking machine fitted with liners that do not slip during milking, that have adequate diameter short milk tubes and an effective airbleed in the clawpiece. Even better protection is achieved by using liners fitted with ‘shields’ or milking with ‘non-return valves’ in the milking machine cluster (see page 16). Inserting instruments through the teat duct should be avoided but when necessary (eg. for therapy) the teat end should be scrubbed with disinfectant for 15 seconds before insertion and the instrument must be sterile. If in doubt about sterility the instrument should be placed in boiling water for at least 30 seconds, but if this is impractical it should be scrubbed in surgical spirit (70% ethanol). A number of antimicrobial systems occur in the bovine udder and milk but they appear to be relatively ineffective in preventing infections though they are important in reducing the severity of infections and to a lesser degree in eliminating infections. The hosts defences are partly cellular (leucocytes) and immune defences and in addition there are non-specific defences provided by complex biochemical systems including enzymes and other constituents of milk. Although most types of infection tend to persist for months if untreated the cellular defences will eliminate most E. coli infections providing the cows cellular response to infection is rapid. This brief description of the prime importance of pathogen exposure, duct penetration and the establishment of infection deals only with the main aspects that are important in considering mastitis control. The interactions are more complex and not fully understood. There are other physiological and environmental factors which are or appear to be important in particular herds. These include nutrition, heat stress and factors such as age of cow and stage of lactation. - treatment is by infusions of antibiotic preparations through the teat duct. Most clinical mastitis is cured but infections may not be eliminated. - treatment with special products at drying off gives higher rates of elimination and prevents new dry period infections. - after treatment do not add antibiotic contaminated milk into bulk supply until recommended antibiotic retention period has elapsed. - some severe cases of mastitis may not respond to infusions of antibiotic. - cows that have repeated cases of clinical mastitis should be culled. Apart from E. coli infections most persist if untreated until eventually there is spontaneous recovery or the cow is culled. This persistance of infection for weeks, months and years with staphylococcal infections is an important characteristic of mastitis which must be taken into account in devising a disease control. Because spontaneous recovery occurs infrequently and there is no proven way of increasing it the introduction of antibiotic therapy was a major advance in controlling bovine mastitis. Infusing antibiotics via the teat duct into the udder is a simple way of overcoming nearly all clinical mastitis and of eliminating many infections. Many antimicrobial drugs are used in formulating products for mastitis therapy (eg. penicillin including the semisynthetics, streptomycin, aureomycin). The effectiveness of the drug will depend partly on the sensitivity of the pathogen treated to the drug used and also to the way the drug is formulated. This influences the absorption, distribution, metabolism and excretion of the drugs from the milk. No antimicrobial drug is ideal for all conditions and mixtures are used to be effective against a range of pathogens (ie. ‘broad spectrum’) for use in lactating and dry cows. Nearly all therapy is given without prior knowledge of the causative pathogen. Under these conditions treating quarters exhibiting clinical mastitis with basic standard products gives a bacteriological elimination of 75–90% of streptococcal and about 30% of staphylococcal infections. The cure rates of mycoplasma and pseudomonad infections are lower. If the treatments are given after the final milking of lactation (ie. dry cow therapy) using formulations designed for this purpose the cure rates are improved and are about 50% for staphylococcal infections. The rates of elimination of staphylococcal infections varies considerably between herds and are lower in cows with more than one infected quarter and those with more severe clinical mastitis. Antibiotic therapy is usually given as infusions of solutions through the teat duct but this should be done only after careful cleaning of the teat orifice with a disinfectant swab. To avoid infusing contaminated antibiotic, use only factory made disposable syringes. A course of therapy is often 2 or 3 infusions at 24 hour intervals, rejecting the milk from the cow for 2 or more days after the last infusion to avoid antibiotic contamination of the bulk milk. Although nearly all cases of clinical mastitis respond quickly it may take several days before the milk becomes normal. Treatment, the choice of antibiotic and the milk reject time should be on veterinary advice and when there are severe persistent infections systemic administration of antibiotic may also be used to overcome the endotoxaemia. Many infections are eliminated by culling cows and this can be increased by the sale of cows with persistant clinical mastitis. - because mastitis occurs in all herds and causes economic losses in most, the control routine is a continuous operation that must be economic and fit easily into a milking routine. Mastitis cannot be eradicated but can be reduced to low levels by adopting simple economic management routines that relate to the patterns of infection. Currently it is not possible to base a control on vaccination and although cows susceptibilities are largely inherent there are major practical limitations to control through breeding, and progress would be slow. Therapy is invaluable to contain the problem but cannot be the basis of a control which must depend on preventing new infections. In practice the key to control is good cattle management particularly steps to reduce exposure to pathogens and also the planned use of antibiotic therapy. Because control depends on management the steps must be simple and economic and fit easily into a milking routine. There are three main patterns of infectious mastitis. The first is the most common and is caused by Streptococcus agalactiae, Staph. aureus and Str. dysgalactiae. These infections usually persist as subclinical infections and this persistance is important. Even if the rate of new infection is considerably reduced the proportion of infected quarters will decline slowly over several years, unless the duration of infection is also reduced. In addition to general good management including sound milking methods, teat disinfection (ie. dipping or spraying) is particularly useful to prevent these infections, by reducing exposure to pathogens. To reduce the persistance of infection the key step is dry cow therapy. The second type of infection occurs mainly in housed or closely corralled cattle and is typified by acute clinical mastitis in early lactation. The main pathogens are Str. uberis and E. coli and their epidemiology is such that they are not controlled by teat disinfection (see above). Drying off therapy is useful in preventing Str. uberis infections that commonly occur early in the dry period but it will not reduce the Str. uberis and E. coliform infections occurring at, and soon after, calving. Control depends primarily on reducing the exposure to pathogens by moving cattle regularly to clean corrals or providing clean bedding, preferably daily. The third type of infection occurs in non-lactating cows. These are common in the early part of the dry period particularly with Str. uberis and most persist causing clinical mastitis in the following lactation. Another form common in N. Europe occurs later in the dry period and is caused by a complex infection with Corynebacterium pyogenes, Peptococcus indolicus and streptococci. This is ‘summer’ or ‘heifer’ mastitis and its aetiology appears to require exposure to pathogens carried by a species of fly. Control is achieved by drying off therapy and fly control. It is important to recognise that because most mastitis is subclinical and unseen control depends primarily on adopting sound management routines for the whole herd. It cannot be achieved by using laboratory tests to identify individual infected cows and taking special action with these animals. Tests are useful to alert farmers to the extent of the problem but they rarely indicate steps additional to those that should be in the daily routine. In a concise monograph it is impossible to cover the causes of all types of mastitis. Infrequently a herd mastitis outbreak will occur with an unusual pathogen even when the farmer adopts good control routines. The solution of this type of problem does require investigation by a veterinary diagnostic laboratory in order to discover the source of pathogen and the aetiology. The following routine will reduce the proportion of infected cows and clinical mastitis by at least 70% if used regularly at each milking. Mastitis caused by Str. agalactiae will be reduced to very low levels and is frequently eradicated. Adopt good cow management practices as the essential basis for a mastitis control routine (eg. feeding, housing, hygiene). Mastitis is unlikely to be controlled with neglected, underfed cows kept under stress in dirty conditions. Adopt practices that prevent the occurrence of teat lesions (sores, chaps and teat damage). If they occur use a teat dip or spray containing a emolient. minimise the effects of vacuum fluctuations by avoiding ‘linerslip’, fitting ‘shields’ or ‘non-return valves’ into short milk tubes or liners. CULL COWS WITH REPEATED CLINICAL MASTITIS. Although laboratory support is essential it is important to recognise that mastitis is widespread and for successful control in a national herd or the herds in a cooperative it is necessary that most, preferably all, the herds carry out the routine. A control that concentrates on improving the worst 10 to 20% of herds will have little effect on the total problem of mastitis. EFFECTIVE MASTITIS CONTROL DEPENDS ON FARMERS REGULARLY FOLLOWING THE SIMPLE MANAGEMENT PRACTICES. Tests will not often provide information that leads to special action for farmers to take that is additional to what they should be doing. The tests for mastitis are either microbiological, to detect the causative pathogen (IDF Bull 132), or tests for the changes in the composition of milk which occurs with the inflammation. Tests for pathogens are not required routinely but are necessary to investigate special herd problems. The tests for changes in milk composition are simpler and some may be carried out on the farm (eg. California Mastitis Test). Electronic automated laboratory tests for somatic cells in milk (eg. using Fossomatic or Coulter equipment) can be used to provide regular information to farmers. Many other tests are also available which measure specific biochemical changes in the composition of milk (eg. Bovine serum albumin (BSA); antitrypsin test and NAGase test). The most widely used for routine screening of farm bulk milks is electronic cell counting which can readily be integrated with other tests of milk composition. When it is necessary to detect abnormal quarters on the farm a simple cowside test is useful (eg. CMT).